Being someone who has to always play the PAL versions of games, I usually have to wait ages and end up feeling bad because everyone else already played the game 12 years ago or something. 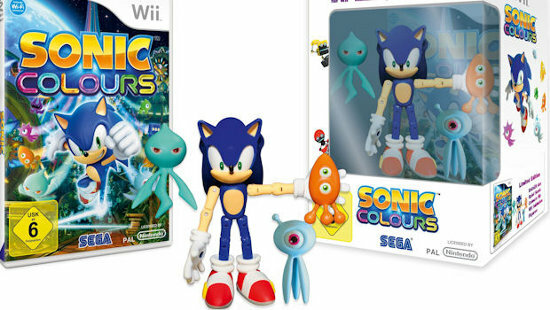 But occasionally game companies will throw us European gamers something cool, like this Sonic Colours special edition! This limited edition will come with a bunch of figures which of course include Sonic himself and a bunch of his wispy friends. Personally the Sonic figure looks a bit iffy with the massive joints but the wisps look good enough to put on any gamer’s desk. Still it doesn’t make up for that hat that America gets. I want that bloody Sonic hat. What’s up with Sonic’s mouth? Looks like he got exposed to some Joker gas. Aren’t Sonic’s pupils too small as well? Any figures with these style of joints are a terrible idea. You know what needs to be said – regardless of the quality of all the Sonic games that have come out since the Genesis era, all are unified by the fact that they have great covers. Every single one of them. Every time I see a cover I think “This is the one.” That Sonic Colours (the way it should be spelled says this Canadian!) cover doesn’t disappoint, either. Looking forward to this. I think this is better than a sonic hat. I already have a hat!! I want thiiiiiis!! Oh my gosh I’m going to be skipping so many meals this holiday season to buy all these games. This is pretty cool but I’m happy with the hat we’ll be getting in the U.S.